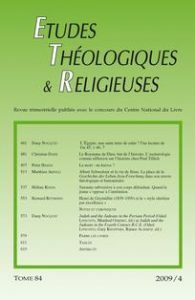 Études théologiques et religieuses > Articles > HAIGIS Peter > La mort : un kairos ? Is it possible to construe death by using the concept of kairos as Tillich did, i.e., as a concept referring to a collective eschatology rather than to an individual one ? Peter Haigis argues that, seen from an ontological and theological point of view, death can be understood as a kairos par excellence, namely as a crossing point between temporal reality and eternity.